The Near, the nearly, and the prior. are related historically and some are parallel creations. It is generally reported, that 'three teachers [from three locales and lineages] taught their knowledges to Wu Yi-hui....who would then demonstrate it in Shanghai...and later taught it as an academic subject at the Nanjing Martial Institute...this would have resulted in a body of three-inputs...and a greater collective body of addended auxiliary martial exercises. Note : Chan, He-lu, ( Chan, Hok-kung ) [was considered the prior lineage holder] he was trained by three teachers [as was Wu Yi-hui]. Commentary : It is questionable as to where [?] and from whom [?] and therefore what [?] each teacher transfered; and it is also plausible that each of the three teachers had had other students during their lifetimes [and whatever happened to these students' knowledges, which do not appear any place otherwise?]. Note: While Wu was a teacher at the Nanjing Institute, aspects of dragon swimming were likely also taught; likely derived from closeby teachers. Bian liang, Bianjing, Daliang, Liang; prefecture-size city, Eastern Henan. Now called Kaifeng. 開封 known previously by several names is a prefecture level city in eastern Henan Province; the province of Shandong is to the northeast. Msr. Wu's most notable 'teaching' locales where Shanghai, Nanjing, and Kunming. He also did some teaching outside of pre-communist China. There also seems to be a notable difference between the earlier Shanghai version and the Nanjing-66 academic version. Exercises later taught in Shanghai and Hongkong with style-variations (taiji-, xingyi-, bagua- yiquan) all called LHPF in principal and form, but visually are not equal to the Nanjing-66 form nor to the later Wushu-competition adaptations. It also needs to be considered what other Martial arts each teacher knew which may have been influential to style-manner of exercise. LHBF-STD : Traditional Nanjing-66 system taught by students of Wu Yi-hui. LHBF-Hun-Yuan : Monk Ho Yue tim teaches spiraling [hun yuan yi qi zhang 混元一氣掌 ] influencing a select group in Hong Kong. Commentary : It could be further outlined that each LHBF, even though being derived from one of the above channel-sources, takes on the characteristics of each 'teacher' or 'student'. ie. within the collective of Hong Kong-LHBF, each teacher tends to emphasize some aspect and interpret purpose and application differently. This is also true for Yi-quan or Yang-Family Tai-Chi-boxing. It is generally surmised that upon qigong principles and forms, the LHBF of Wu Yi-hui includes elements from LiuHe-XinYi- and its' auxilliary 'animal' forms, elements and principles from tai-chi- and from Mi-Zong-I 迷蹤藝 BaGua 八卦 [partly due to knowledge and exposure to these styles while teaching in Nanjing]. Additional external exercises where adapted [to internal] to the core teaching, from several Southern 'swimming-dragon' styles inclusive. or Lu Hong Ba Shi 呂紅八勢 [ 呂紅八勢拳 ] which Wu Yi-hui also learned while 'connecting' with LHBF teachers; LH8 was retained and adapted to IMA principles and became part of the formal curriculum. [ Commentary : Lu Hong Ba Shi or Lu Hong's 8-Imperatives Fist, the exercise permeates the Nanjing and Hong Kong LHBF style and has been taught separately as a Southern style of boxing. In general, it is rarely known to most martial artists... hence another reason why LHBF is wrongly compared to other mixed 3-IMA. The name Lu Hong can also be a metaphor rather than a name. It does however carry the idea LU-'note' and HONG-'red', implying an Imperial Directive; the implementation as eight grouped forms, is sometimes also called 'Eight-Link-Fist'. In practice it is contrary-wise to the circulating-palm directions of 'ba-gua' 八卦掌 but more xing-yi- like. Some teachers favor this exercise over the LHBF [Choi Wai-lun]. Although taught with LHBF, teachers make it clear 'it is not a Chen xi-yi sect exercise.' [Lu Gui-yao]. See separate page for LH8 examples and resources. Collectively, it is little wonder..that without all of this inter-mingled exercises..that even noted martial arts historians have trouble classifying LHBF. 螫龍遊 Zhe Long You - Coiled Dragon Swimming: fluid body movement; this is more similar to the early water-boxing than is the LHBF. 螫龍拳 Zhe Long Chuan -Coiled Dragon Fist: serpentine-spiraling characteristic. 龍虎戰 Long Hu Zhan - Dragon and Tiger Fighting: joint locking methods. A group of 'top-level' students, trained by Yi Quan 意拳 founder Wang Xiang-Zhai, were sent to Nanjing to study and learn the LHBF under Wu Yi-hui; collectively they have been called the 'Four Diamonds'. Each student led to an altered LHBF or to an altered YiQuan; which makes practical sense. "Though he taught the Liuhebafa form as "zhu ji chuan" it was highly modified, and using the power Xingyi and Bagua at its core. His version had less stepping and lower-body focus than the original, using Yi Chuan’s relaxed stepping as opposed to Liuhebafa’s structured transitioning stances, and himself labeled it the “ lively step style 活歩式 huo bu shi, accordingly. Zhang wrote an in-depth book on Liuhebafa that was published in 1990, the same year he died. 2> Han Xing-jiao 韓星橋, Han Xing-qiao ; Cantonese: Hon Sing Kiu, ( 1909-2004; 95 ) created Han Family Yi Chuan, han jia yi quan. 韓家意拳, Han-jia LHBF 韓家六合八法 Older Brother of Han Xing-yuan; retired to Zu Hai and taught YQ and his-LHBF; operated a clinic for qi-gong therapeutics. Han propagated the style of Yi Chuan under his own personal branch of the art called Han Family. This was part marketing and school distinction. It is also claimed that one of his LHBF teachers Liang Zhi-peng also used Tai-Chi- as HuaYo- style in marketing himslef in Hong Kong. Later, Li Chung begin absorption of 混元式 HunYuan principles also. NOTE: there does exist counter gossip that not all of Wang's students wanted to learn LHBF or that not all of them went to study LHBF. It is important when receiving martial history data to understand that it is usually accepted without comment and alternative negativity to preserve teacher vanity has been deleted. This if taught intact would have been passed through to teacher-student Zhou Shu-sheng 周树生 now teaching in Singapore and then to student Helen Liang during her visits. This did not happen as demonstrated. However, the large prior history of study of Snake style and Emei styles by the Liang Family tends to change the usual forms and their manner. Peter Ziboce [1953 - ) 邵保勝 resident of Hong Kong, studied Yang Family Style TaiChi- with Fong Pak Shing. He received inspiration from Fong on the movement of chi [qi], its rhythm, and its lightness. 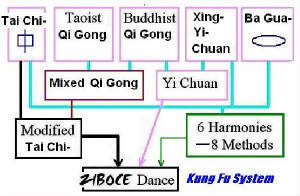 In time, after learning LiuHeBaFa, the taichi-ruler, yichuan, and related stylings, Msr Ziboce perceived that they could be blended and created a 'Zen' Dance, named Ze Gong 澤宮. It is not immediately obvious that currently 'available' exercises being taught in China and USA [Boston, MA] are closely similar to the principles and formed patterns of LHBF. Some of there names betrays their principles and some lead into a confusion of historical and cosmological named concepts. The opening sequence is almost identical to that of LHBF.The sequence forms following parallels that of the first half of the LHBF series. This is surprising and requres further study. and also claims its own 'tai-chi-' and nei-jia internal principles style. 趙堡太極拳 which mimics characteristics of LHBF. The motions of vibrating, waving, or spiraling are intrinic to waterstyle-6x8, but appear and are utilized ocassionally or extensively in other exercises; this is discussed and presented in the claimed Wudang-sourced Tai Chi by Erle Montaiue. 'water' boxing in principle or to 'LHBF' boxing in form-principles; this can be through either contact [usually not acknowledged] or through parallel creation ideology. 1. Tai Tzu Chang Chuan : the 'imperial' Tai-Zu skill = Chen Tai-Chi-boxing. 2. Wun-Yuan Yi-Qi Zhang : a simple before and now key to original. 4. Waving hands 揮著手 Tai Chi-: a non-secret method of Mt.Hua or WuDang? 5. Yon Quan, Mian Quan : a name is another name. 6. Si Xiang Chuan : One-source Four-images exercise of Fu Yong-hui. 7. I-Liq-Chuan : Matrix of another flowing-swimming? Or renaming of LHBF. This forum discussion was initiated by 'doc stier' to attract members' contributation into the similarity or mutuality of Sun Lu-tang's styling of tai-chi-chuan [which is an amalgam of tai-chi-principles, and those of xin-yi-, and those of ba-gua-]. First, the tai-chi principles are tai-chi- but the applicable forms are derived from Hao-tai-chi- [itself a tai-chi-mixture]. The xin-yi is Sun-tai-chi-forms [as derived from his teacher] and the ba-gua-forms are Sun's and his ba-gua-teachers [as derived from Tung]. Thus, already styled as Sun would do each seperately. 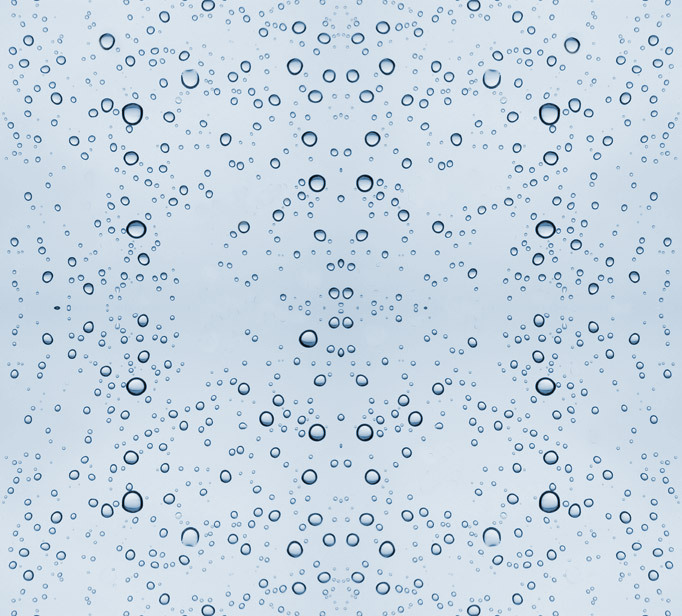 The first, the use of 'water' qigong as shown in this website, which is prior-LHBF [or not at all] but which was taught to one of Sun's students. The second is to attempt the usual comparison with the core CIMA mentioned above, which Nanjing-HK LHBF incorporates as principles, not as CIMA explicit forms, close but not equal. However, the CIMA can indeed be joined to each other, as Master Sun did for his Sun Tai-chi- and others have done. A missing four-patterns form has also been created by Fu.. Yiquan per Wang Xiang-zhai, although deriving first from xin-yi, absorbs the CIMA into his Yiquan ...as principles, not forms, and wrote this in document. His student Han Xing-yuan also showed that CIMA could be joined. I have considered this also, and have shown that 'waving hands' with some variations per xing-yi and ba-gua- is a common form and principle for CIMA and LHBF. Fu Style martial arts (Tai Ji Quan, Liang Yi Quan, Si Xiang Quan, Xing Yi Quan, Ba Gua Zhang. There is great variation in the movements between different styles of Bagua as taught by Tung Hai Chuans. si xiang means, "great yin", "small yin", "great yang" and "small yang"). Shannon Kawika Phelps, Temple of the full autumn moon, del mar Calif.
Phelps, S. "One source, four images: Fu Yonghui's Si-Xiang boxing"
Song Dynasty Tongbei Quan and a link to Hua Shan and Chen Tuan.